A classic display of red and white flower arrangement in a black vase is the perfect way to honour your loved one and express your sympathy. Pure white gladiolus are accented with red carnations roses and greenery to create an impressive display. The perfect gift for "her" or "him", anniversary, Valentine, Day of Women... or to say congratulations. 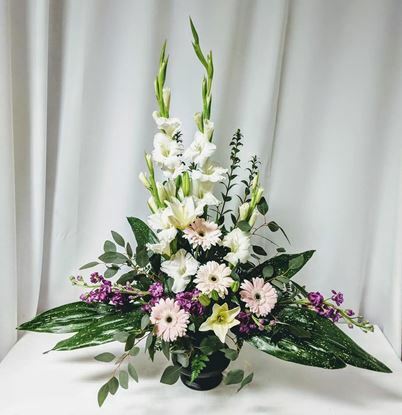 This arrangement is appropriate to send home, to the funeral home or church. 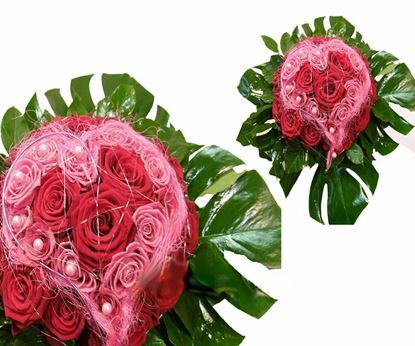 An amazing bouquet in the shape of heart- red and pink roses and more. Express your affection! Surprise and excite the one you love with this breathtaking flower bouquet. This unforgettable bouquet is almost guaranteed to leave her speechless. Roses delivery says ‘I love you’ more eloquently than any words can. The perfect gift for "her" or "him", anniversary, Valentine, Day of Women... or to say congratulations. short stemmed roses 35-40 cm. 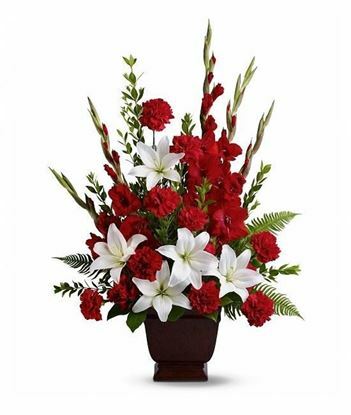 Classic display of white and red flower arrangement in a white vase is the perfect gift for "her" or "him", Anniversary, Valentine, Day of Women... to say congratulations or to express your sympathy. 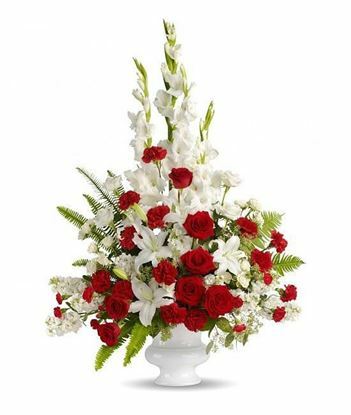 Pure white gladiolus and white lilies are accented with red roses and greenery to create an impressive display. This arrangement is appropriate to send home or to church. Classic display of white flowers and greenery arrangement in vase. Classic display of white flowers arrangement in a white vase is the perfect gift for "her" or "him", Anniversary, Valentine, Day of Women... to say congratulations or to express your sympathy. Pure white gladiolus and white lilies are accented with white big head daisies and greenery to create an impressive display. This arrangement is appropriate to send home or to church. Contemporary rose arrangement in a square clear vase for your love. Express your affection! Surprise and excite the one you love with this breathtaking rose arrangement. This unforgettable flower decoration is almost guaranteed to leave her speechless. Roses delivery says ‘I love you’ more eloquently than any words can. The perfect gift for "her" or "him", anniversary, Valentine, Day of Women... or to say congratulations.